I brought camera gear with me to Asheville. I bring camera gear to every race. More and more, though, it never makes it out of the bag. I’m afforded this luxury because I have an amazing group of contributors who make my camera wielding unnecessary. Bruce Buckley, Brett Rothmeyer and John Kavouris crushed Nationals. The proof is in the pictures. And video? Yeah, I shot a ton of video at Madison and was planning to do the same at Austin until I ended up watching the elite races in an airport. For this year I brought all of the gear yet didn’t shoot one frame of video. And even if I had, I’m not sure I’d bother editing it after seeing the great work the next generation, including Noah Bell and Gentry Jefferson, are creating. Along with having a great team producing top-shelf content, I was a bit preoccupied during the weekend. Having the opportunity to be part of the pre-game show for the live-stream broadcast was amazing. And something I hope to do again in the future. As an aside, if you crapped on the live broadcast, I won’t hold it against you. But you should know that the team of folks on the ground trying to produce that show had obstacles placed in front of them that you could not even fathom. The fact that there was a broadcast at all is a huge accomplishment unto itself. So the morning of the elite races for me was spent trying not to embarrass myself on live webevision. After my time chatting with Tim Johnson and Brad Sohner on the VW set came to a close, I was free to enjoy the races. Because weeks earlier I went through the motions of applying for media credentials and a photo vest, I figured I should grab some gear and put those to use. So I took my camera, a single prime lens, and went off to enjoy the races. 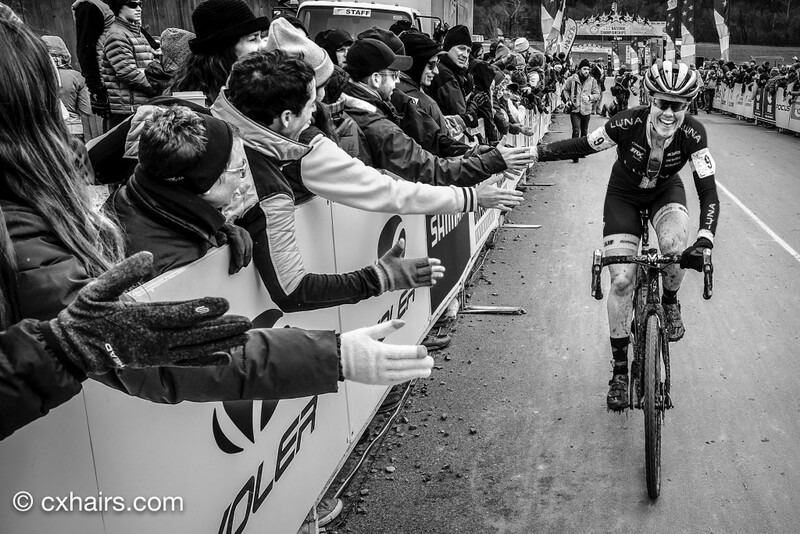 The women’s elite race was intense. The battle between Katie Compton and Georgia Gould was everything you could want in a championship race. 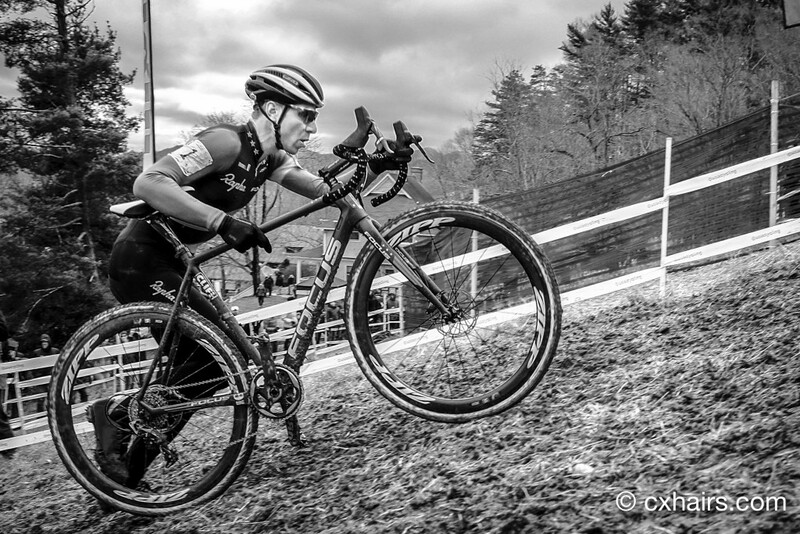 The olympic mountainbiker against the most decorated American cyclocrosser. Georgia may climb a little better and have skills for miles but Katie has the power and the descending chops to keep up with Gould everywhere on the challenging track. I would have been excited to see either Georgia or Katie win. They are both wonderful. And even if Georgia was disappointed by not winning—and deep down inside how could she not be … we all would be—she didn’t show it. Always a crowd favorite and for a good reason. 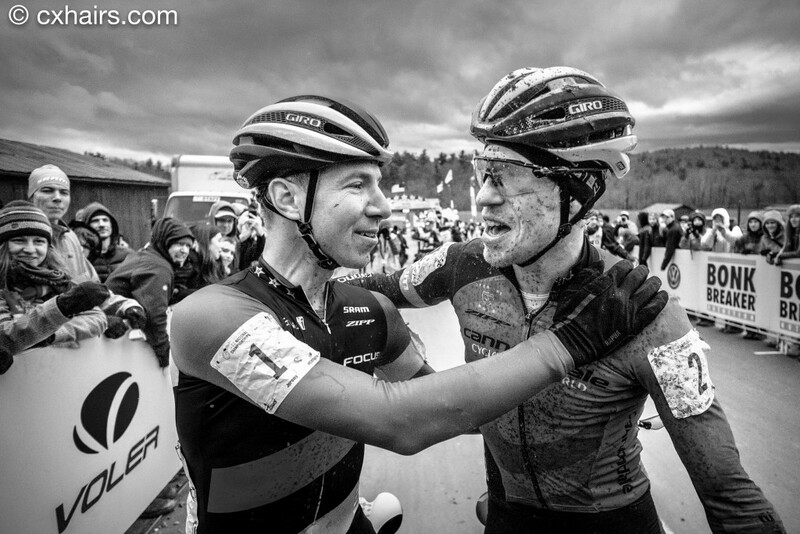 The race at the front was, without a doubt, one of mutual respect. And after it was all over, Compton and Gould shared a moment. I was evidently more drawn to the camera guy, so he’s the focus of this next photo. Artistic license or something. Following the women’s race, and without any further broadcast duties, I had time to make it to staging for the men’s race. 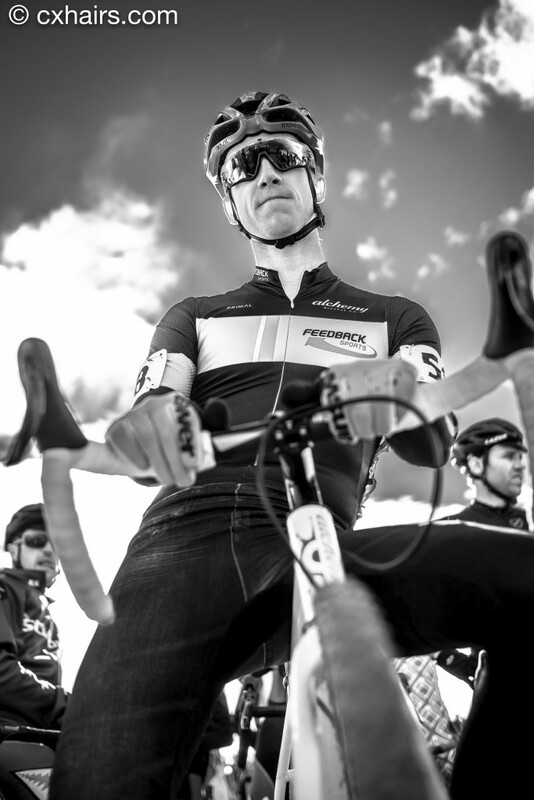 Once there I learned that Jeremy Powers and Stephen Hyde have the worst game faces ever. That being said, I love this next photo. It truly shows how a friendship and rivalry can co-exist. At least that’s the narrative I’m giving it. You can try out your own narrative. Feel free to do so in the comments. But be nice … I moderate those comments. 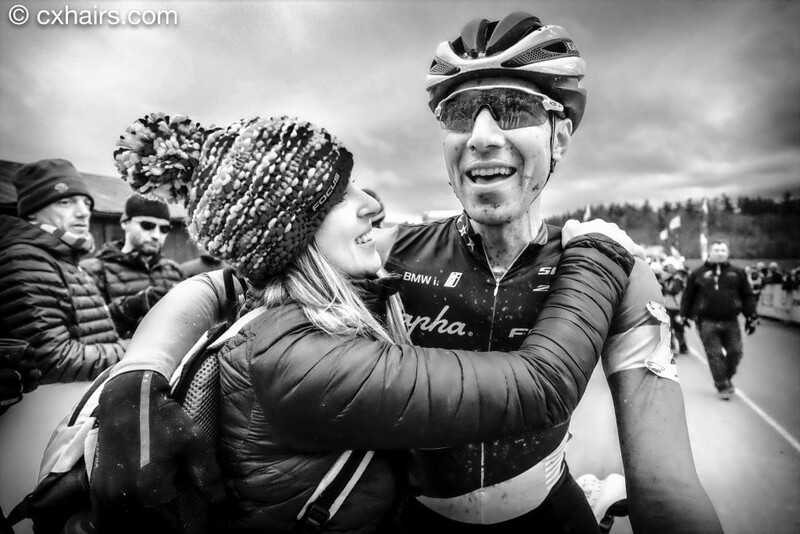 Not to jump out of order, but that photo and this next one, taken moments after the finish, really need to be near each other. They are such nice companion pieces. As an aside from the great moment captured here, also take a second to ponder how in the heck Hyde could actually see the course through those glasses. 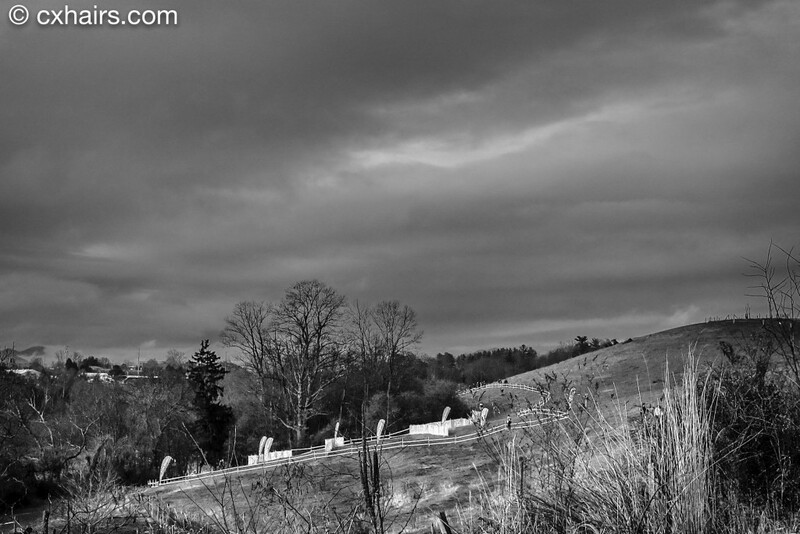 During the actual race, I had the opportunity to explore some secret spots tucked away in the nooks and crannies of the Biltmore Estate’s Antler Hill Village. For instance, did you even know this place existed on the course? Where are they going? The answer is they are going to one of the two pro-only sections. This is the secret pro-only section that even Jeremy Powers didn’t know existed until days before the race. 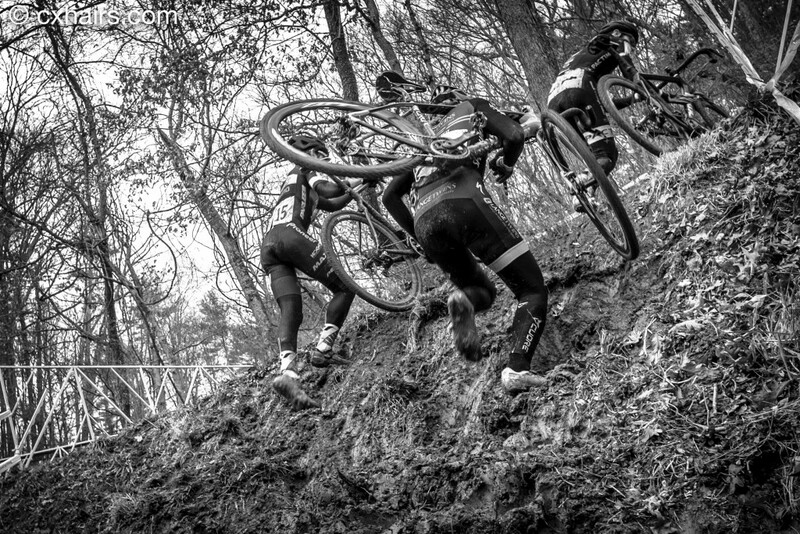 If you heard about riders having cleat issues during the race, this section was the reason why. It was muddy. Technique controversies aside, Hyde opted to ride the hill. Here he’s in third place trying to catch back on to the leading duo of Powers and Logan Owen. The crowd is going nuts for Hyde. The crowd just didn’t seem to appreciate a good solid runner. Also, this is a horrible angle. It’s really much steeper than this. 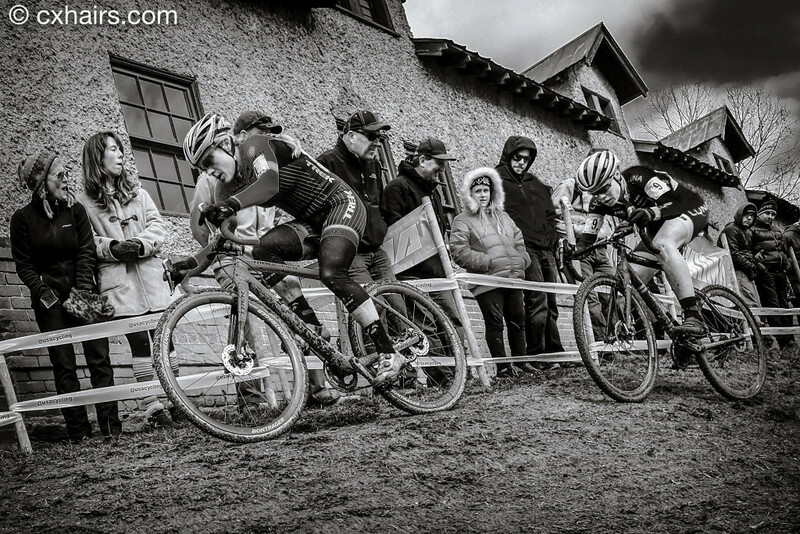 Side note: I hope that person bottom right sent their video to feedback@cxhairs.com to be included in the crowd-sourced video. (Let’s be honest … it’s 50/50 that video ever gets made. But I still want to see your clips!). Here’s another secret place. Man, what a view. I don’t know if people racing were able to enjoy it, but it was pretty spectacular. Powers and his calves are flying through this section at around 30 mph. 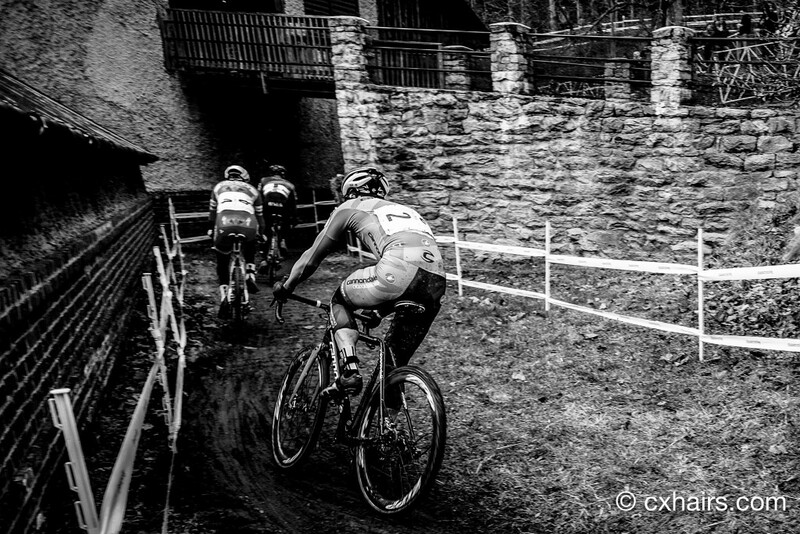 The sprint you may never see, or even know takes place, in a pro cyclocross race is the one amongst the photographers as they race to the finish line during the last lap to be in place when the winner crosses the line. With my one wide-angle lens and the photo corral way down the finishing chute, there was no way I was getting a decent picture of Powers posting up over the line. But I’m okay with that. 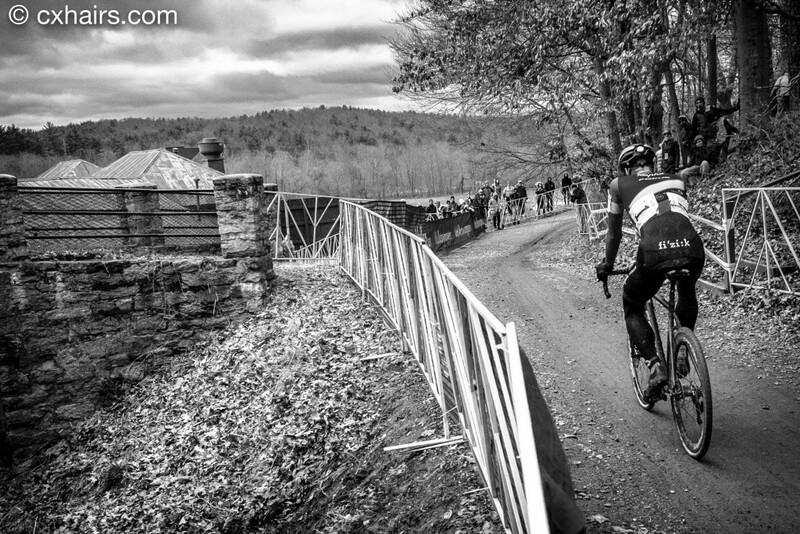 I’ll take this shot over the finish line shot any day of the week. 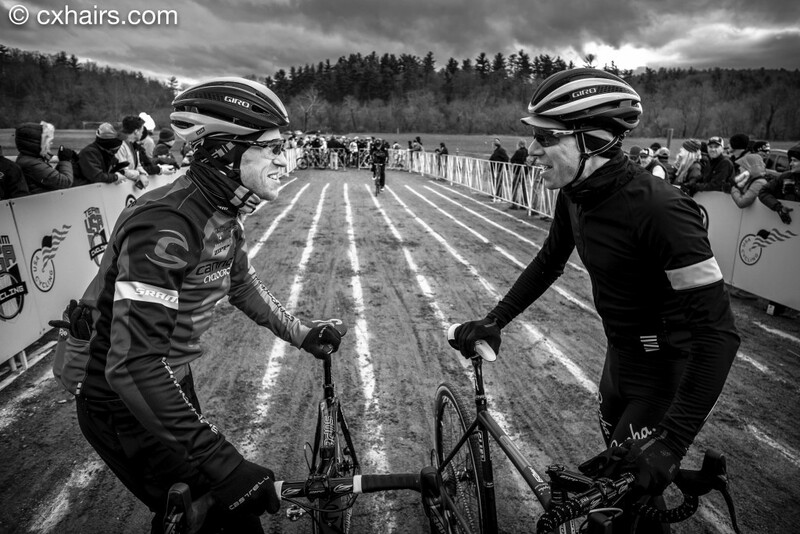 Earlier in the week, I grabbed the camera and headed over to staging to cheer on my Crosshairs Cycling teammates who were competing in the single-speed race. 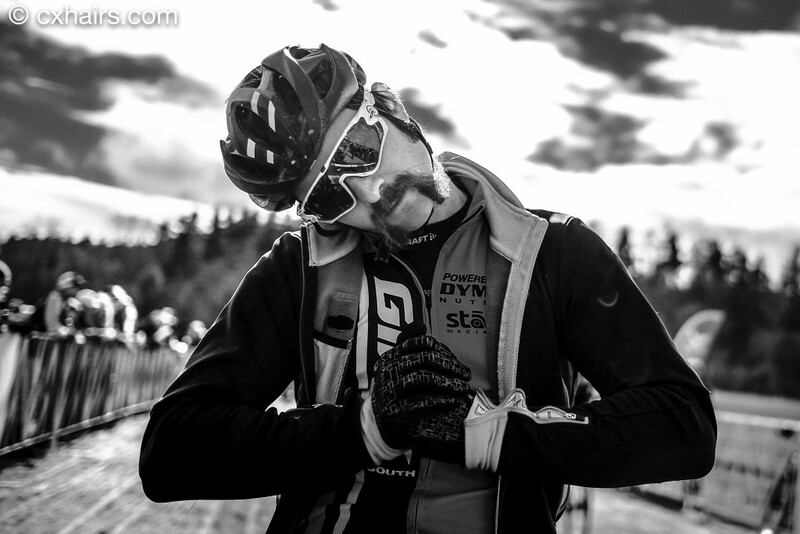 While there, I got some shots at the start line. You guys know about rim light? 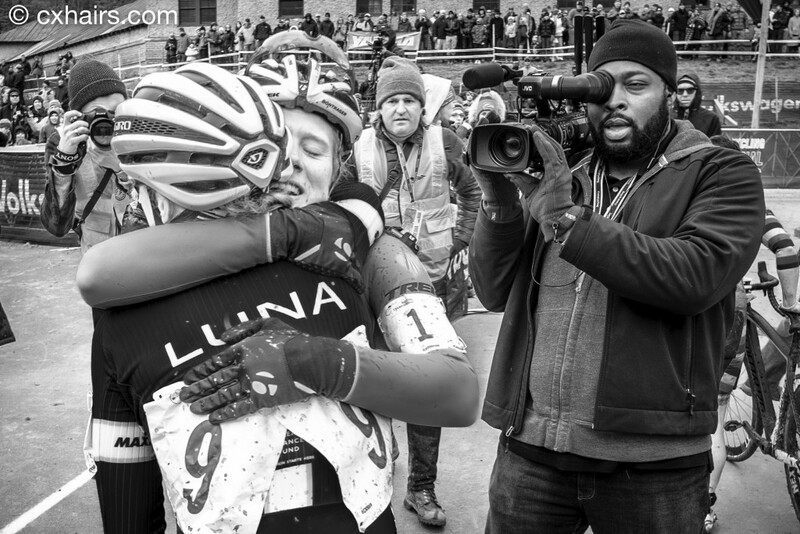 Thanks everybody for following along with our U.S. Cyclocross Nationals coverage. And stay tuned. There’s more to come. Always more to come. I always wait for and come back to your pics, interviews and podcasts. 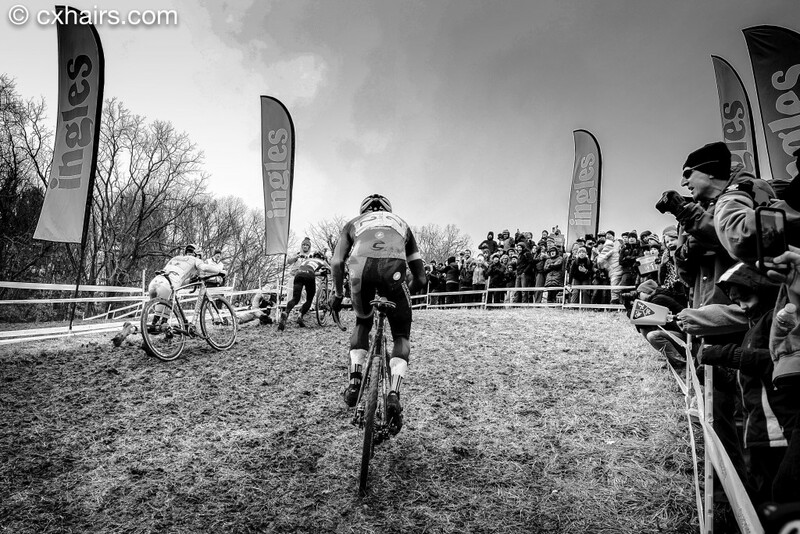 These of CXNATS are awesome, thanks so much for the perspective! Nice to see the Big Picture from Schieken’s POV! My cyclocrossing kid — who’d raced in the junior men’s 13-14 event — watched the livestream on his phone in the car as we cruised up I-81. I’m old enough to consider that a minor miracle. Awesome work, Bill! Thanks for the gold medal – see you in Tokyo?! Very cool shots. There always seems to be cool spots on these courses we don’t get to see at home. Great shots from a fun perspective! I love that shot of Powers and Hyde at the start.